Biotinylated Human VEGF R3, His Tag (FL4-H82E1) is expressed from human 293 cells (HEK293). It contains AA Tyr 25 - Ile 776 (Accession # P35916-1). The protein has a calculated MW of 88.2 kDa. The protein migrates as 115-120 kDa under reducing (R) condition (SDS-PAGE) due to glycosylation. 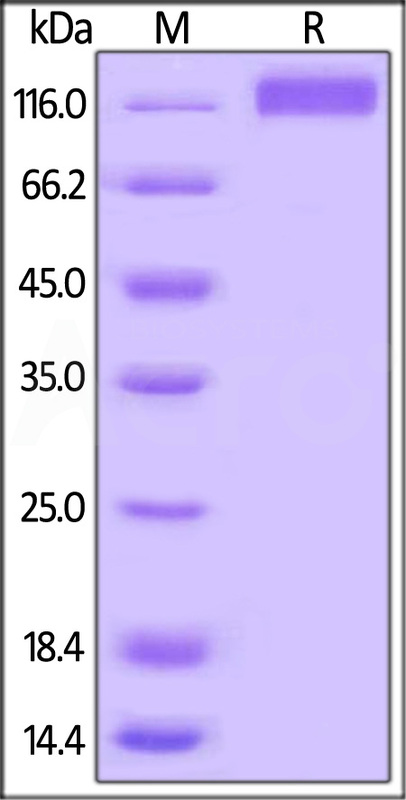 Biotinylated Human VEGF R3, His Tag on SDS-PAGE under reducing (R) condition. The gel was stained overnight with Coomassie Blue. The purity of the protein is greater than 95%. Immobilized Human VEGF-C, His Tag (Cat. No. 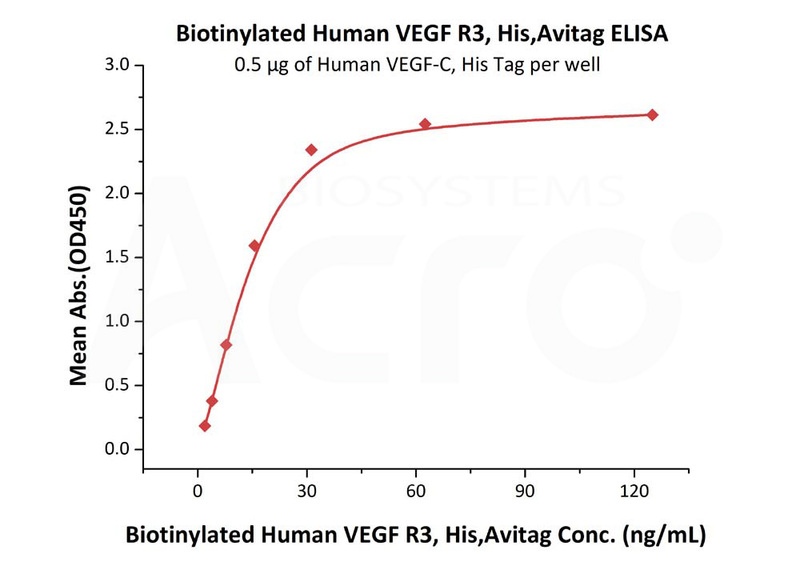 VEC-H4225) at 5 μg/mL (100 μL/well) can bind Biotinylated Human VEGF R3, His Tag (Cat. No. FL4-H82E1) with a linear range of 2-31 ng/mL (QC tested). Vascular endothelial growth factor receptor 3 (VEGF R3), also known as FLT-4, together with the other two members VEGFR1 (FLT-1) and VEGFR2 (KDR/Flk-1) are receptors for vascular endothelial growth factors (VEGF) and belong to the class III subfamily of receptor tyrosine kinases (RTKs). VEGF R3 mediates lymphangiogenesis in response to VEGF-C and VEGF-D. VEGF R3 is widely expressed in the early embryo but becomes restricted to lymphatic endothelia at later stages of development. It is likely that VEGF R3 may be important for lymph angiogenesis. (1) Stuttfeld E., et al., 2009, IUBMB Life, 61 (9): 915-922. (2) Zygmunt T., et al., 2011, Dev Cell, 21 (2): 301-314. (3) Herzog, B., et al., 2011, Molecular Biology of the Cell, 22 (15): 2766-2776.